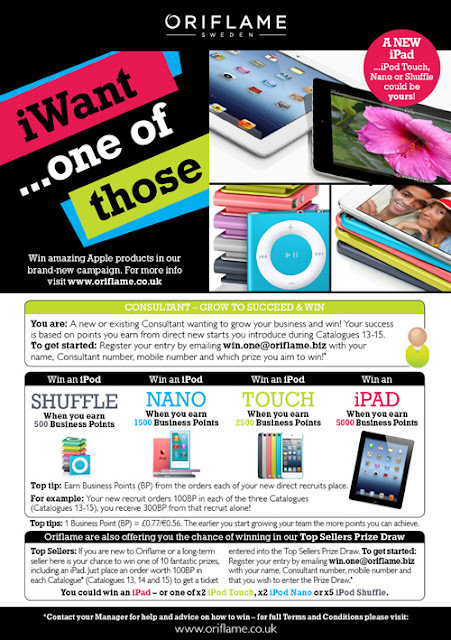 Oriflame UK Independent Consulants: WIN amazing Apple products and be part of Oriflame's BIGGEST incentive yet! WIN amazing Apple products and be part of Oriflame's BIGGEST incentive yet! ANYONE can WIN these amazing Apple products just by joining and growing your Oriflame business. Your success is based on points you earn from direct new starts you introduce to Oriflame during Catalogue 13-15. Simply introduce friends to Oriflame and earn points from their orders, 5000 business points will not only get you the iPAD but fantastic sales too.